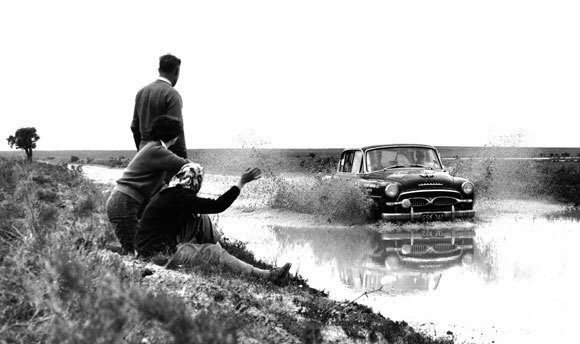 No chronological list of Toyota rally cars can begin without referencing the Toyopet Crown Delux that took on the gruelling Round Australia Rally in 1957. Prepared by a division that would later go on to become Toyota Racing Development, the production four-door saloon completed the 19-day journey in third place among the foreign entries and without any major mechanical problems. The following year a similarly prepared Crown won the Round Japan Rally outright. 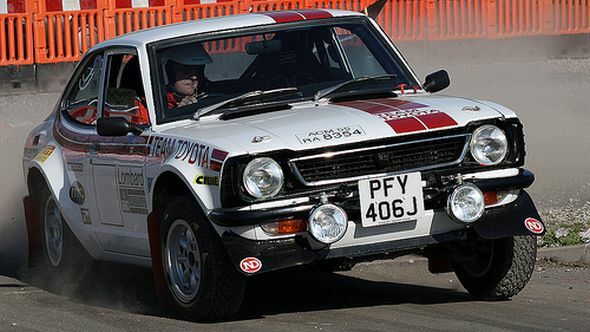 It was Ove Andersson, late founder and president of Team Toyota Europe (TTE but now known as Toyota Motorsport GmbH), that championed the third-generation Corolla coupe as a potential rally car in the mid-1970s. Though the little TE27 couldn’t match the power of rivals with much larger engine capacities, its 1.6-litre engine used a Yamaha-tuned 16-valve head to deliver 180bhp and giant-killing performance. The next-generation Corolla coupe took the baton from the outgoing TE27 in adopting a high-revving 1.6-litre twin cam engine, rear-wheel drive and four-link rear suspension. It took full advantage of the new Group A regulations and immediately became the class star, winning the open championship in 1982 under the direction of John Midgley, again in 1983 with Per Eklund behind the wheel for Toyota GB, and then securing victory in the 1984 national rally championship. Arguably the most exciting rally car Toyota ever built, the Celica Twin-Cam Turbo was the product of new Group B regulations adopted by the World Rally Championship between 1983 and 1986. While many of its contemporaries opted for four-wheel drive, the Celica directed all of its turbocharged 380bhp to the rear wheels. Despite this seeming disadvantage, the Celica proved so dominant in the Safari and Ivory Coast Rallies that it earned the nickname ‘King of Africa’. When the Celica Twin-Cam Turbo took its position as Toyota’s high-performance rally flagship, the new AE86 Corolla GT Coupe became the manufacturer’s giant-killer in the production-based 1.6-litre class it had proved so successful in with the earlier TE27 and TE71 models. 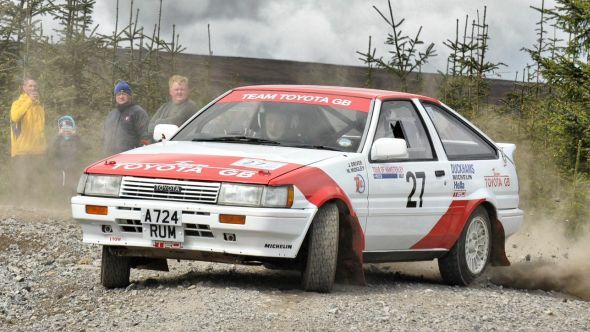 With Per Ekland behind the wheel again, Toyota GB’s rally campaign in Group A was a phenomenon, securing individual wins all over the world and overall victory in the 1984 British Open Championship. 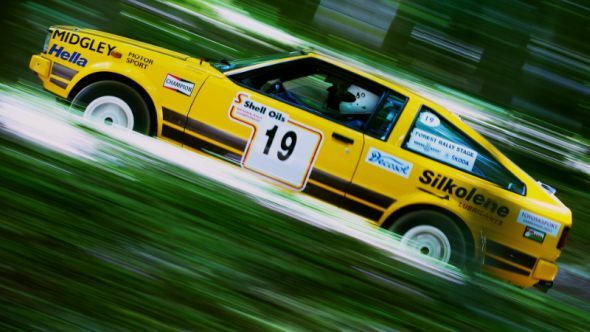 Over 30 years on, the AE86 remains a force in classic rallying and is recognised as the model that inspired the related sport of drifting. 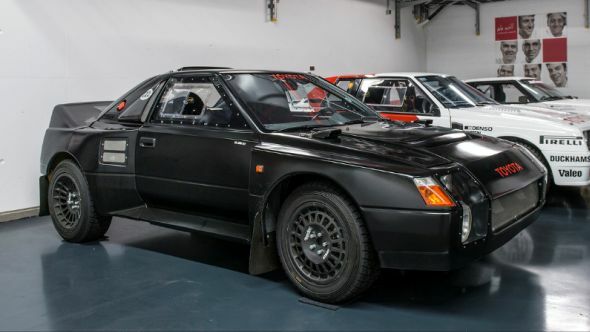 The radical ‘222D’ was Toyota’s planned replacement for the Celica Twin-Cam Turbo, its short wheelbase, all-wheel drive powertrain and mid-mounted 600bhp engine designed to make it outstandingly manoeuvrable on tighter, more twisty European rallies. Loosely based on the first-generation MR2, it actually shared very few components with the production car. Unfortunately, the regulations Toyota built it to comply with were unceremoniously scrapped in 1986, immediately halting the 222D project before it had a chance to compete or to become known by anything other than an internal codename. 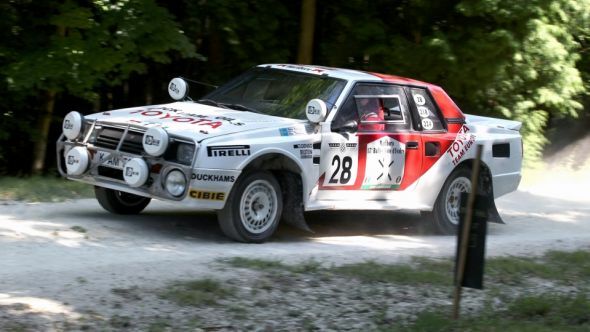 Using knowledge gained in the 222D project, the ST165 Celica GT-Four became Toyota’s first all-wheel drive competition rally car and the first model in which it became possible to compete at the highest level of the WRC against the dominating European manufacturers. It employed a new turbocharged 2.0-litre engine that would go on to power the next three generations of Toyota WRC cars, and catapulted the ST165 to 13 WRC victories not to mention Carlos Sainz to the position of world rally champion in 1990. 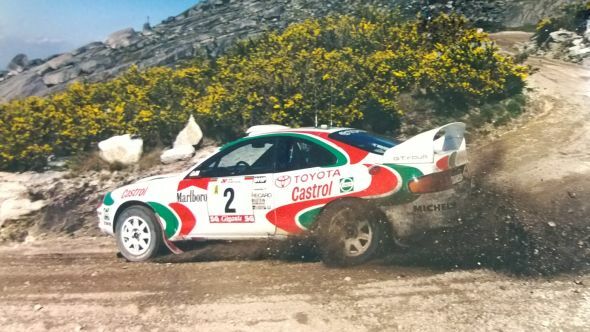 After some initial teething problems, the new ST185 Celica GT-Four became a devastatingly effective rally weapon that managed to build on the success of the outgoing model. During the 1992, 1993 and 1994 seasons it racked up an incredible 16 WRC wins, three WRC drivers’ titles and two WRC manufacturers’ titles. Thanks to a sponsorship deal with Castrol, the ST185 also introduced the distinctive white, green and red race livery, but beneath these the new vehicle could be identified by the adoption of numerous grilles and ducts that vastly improved the engine’s cooling efficiency. 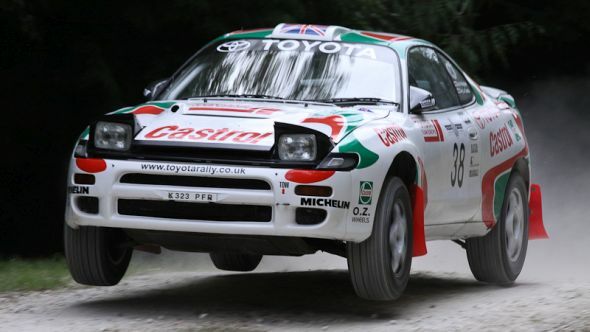 The ST205 Celica GT-Four was the last works-engineered Celica rally car and employed a further evolution of the 2.0-litre 3S-GTE engine first seen in the ST165. Indeed, it pioneered the use of anti-lag boost technology that was later adopted by all other teams running turbocharged engines. The ST205 was introduced towards the end of the 1994 World Rally Championship season as a prelude to what was planned to be a full campaign the following year. Driver Juha Kankkunen steered the Celica to victory in Corsica during 1995, and the whole team amassed a further five podium finishes before leaving the championship. 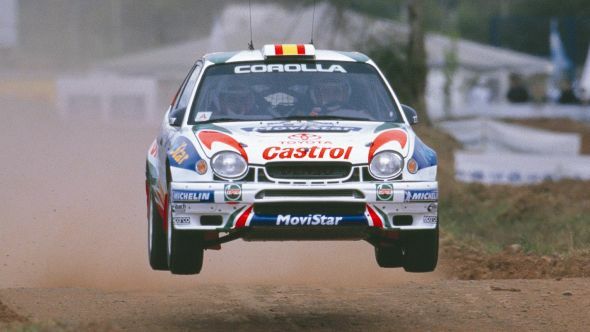 On its arrival part-way through the 1997 season, the Corolla WRC was hailed as the purest and most advanced rally machine Toyota had ever built. More compact and nimble than the outgoing Celica, it was unique in being the first WRC car to feature a transverse-mounted engine. Within four rounds the Corolla secured its first podium finish and pitched an emphatic victory in the first round of the 1998 season. Toyota and driver Carlos Sainz were runners-up in the manufacturers’ and drivers’ championships respectively in 1998, and Toyota improved on that performance the following year by becoming the sport’s number one manufacturer. The Corolla WRC did not return in 2000 but continued to reap success in private entries. It certainly wasn’t the fastest or most powerful rally car Toyota has ever built but this first-generation Prius is recognised as the first hybrid vehicle to enter and finish an official FIA-sanctioned event. Reliability rather than speed was more important in the gruelling 5,000-mile and three-week Midnight Sun to Red Sea Rally held in 2002, yet with only minimal modifications the showroom specification Prius still managed to arrive in 14th position overall. 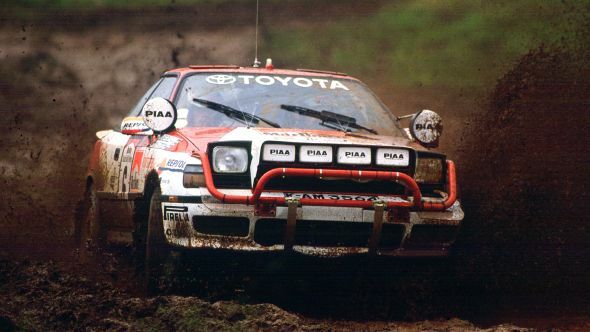 Toyota is a relative newcomer to the Dakar Rally, widely recognised as the world’s toughest off-road motorsport event. But the Hilux Dakar certainly made a huge impression when it first appeared in 2012, clinching third place overall and the best finish for a petrol-engine car in three years, despite complying with production-based regulations. 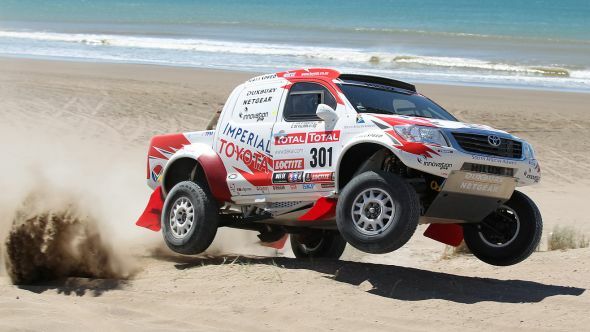 Expectations were exceeded again in 2015, with the Hilux Dakar finishing an incredible second place overall. Toyota has been highly successful in rallying since pioneering the introduction of the S2000 class in South Africa in 2006. The series began with the Corolla-based RunX model that was unique to South Africa before progressing in 2008 to the British-built Auris. 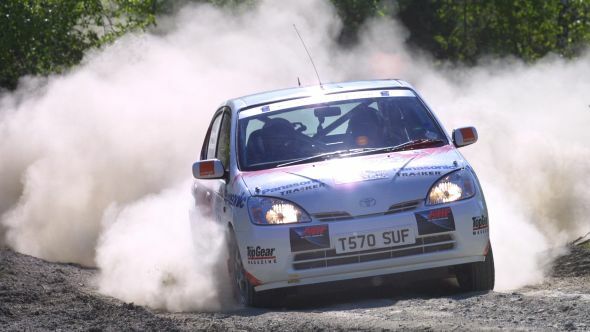 Now using Yaris as a base – the first Yaris to contest a national rally championship anywhere in the world – the car is run by the same experienced team that takes care of Toyota’s Dakar campaign. 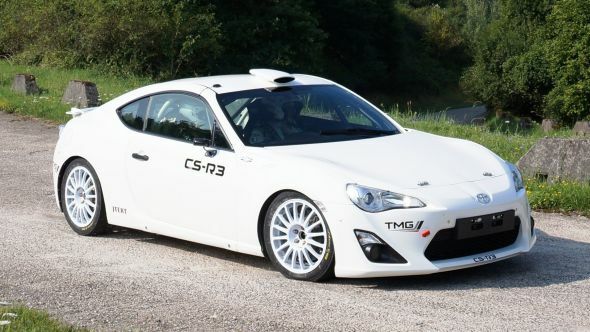 The new Toyota GT86 CS-R3 prototype is a rear-wheel drive rally car that offers echoes of the Celica Twin-Cam Turbo of the 1980s. Developed by Toyota Motorsport in Europe, it is designed as a cost-effective competition model for private customers participating at all levels of the sport. The programme concentrated on reducing weight and improving safety, reliability and fun, an element of the latter being physical and software modifications to the 2.0-litre boxer engine that increase the output to 240-250bhp. The first customer cars will be available in kit form during the first quarter of 2015, making this a future classic to add to Toyota’s rally car hall of fame.